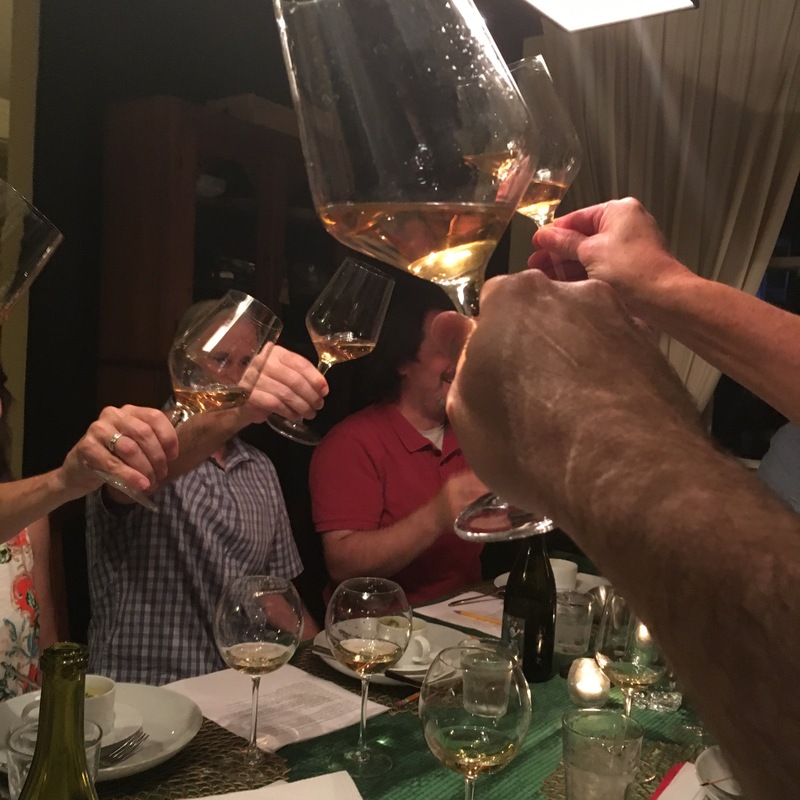 Our wine tasting and dinner group that began meeting semi-monthly in early 2011 gathered over Labor Day weekend to mark our 50th tasting together. Our tasting format is fairly simple. Members volunteer to host the group usually on a Saturday evening. We typically choose around eight wines to pair with food (usually begin with whites and end with bold reds). In our first year together, we often cooked more food than we could possibly consume. 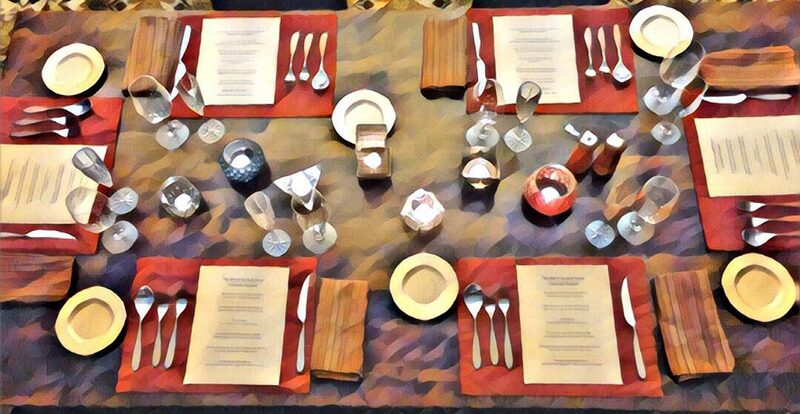 Members of the group gradually learned to prepare smaller plates to serve with each wine, much like a multi-course dinner with wine pairings at a fine restaurant. We revel in dazzling and challenging each other with new dishes each time we meet. Our 50th tasting had to be special. Rich and Paul, the wine brains of our small operation, chose the wines for us with a Napa and Sonoma focus based on a recent tasting trip to California. The group responded with fantastic summer dishes to help celebrate. Many thanks to Rich Helms for contributing most of the wine tasting notes below. 2014 Staglin Salus Unoaked Chardonnay, Napa. $112. Citrus and lemon cream pie, light and refreshing. Winemaker Fredrick Johanssen. 2012 Tuck Beckstoffer (yes that Beckstoffer) Semper Chardonnay, Sonoma. $65. More fruit forward than the next wine, pear, and apple. Winemaker Tuck Beckstoffer. Debra and John brought skewers of fresh watermelon and grilled shrimp. Simple and delicious. The shrimp paired well with the Staglin Salus. The Semper proved a good match with the sweet watermelon. These very different chards were a joy to drink. 2002(!) Konsgaard Chardonnay, Napa. $85. Deliberately produced in a slightly oxidized, nutty style. Orange liqueur, hazelnut. Weird. John Konsgaard winemaker. Sadly, this bottle sat too long on the shelf. In the glass, dry sherry came to my nose but tasted vinegary on the tongue. 2013 Tor Hudson Vineyard Chardonnay, Napa. $65. Toast, buttered popcorn, not over done, yummy. Jeff Ames winemaker. The smoked corn and cumin in my puréed soup paired well with this wine despite a little too much heat from jalapeño. 2014 Renteria Brown Ranch Pinot Noir, Napa. $105 One of the most unique Pinot noir tasted. Leather, plum, burgundian in style. 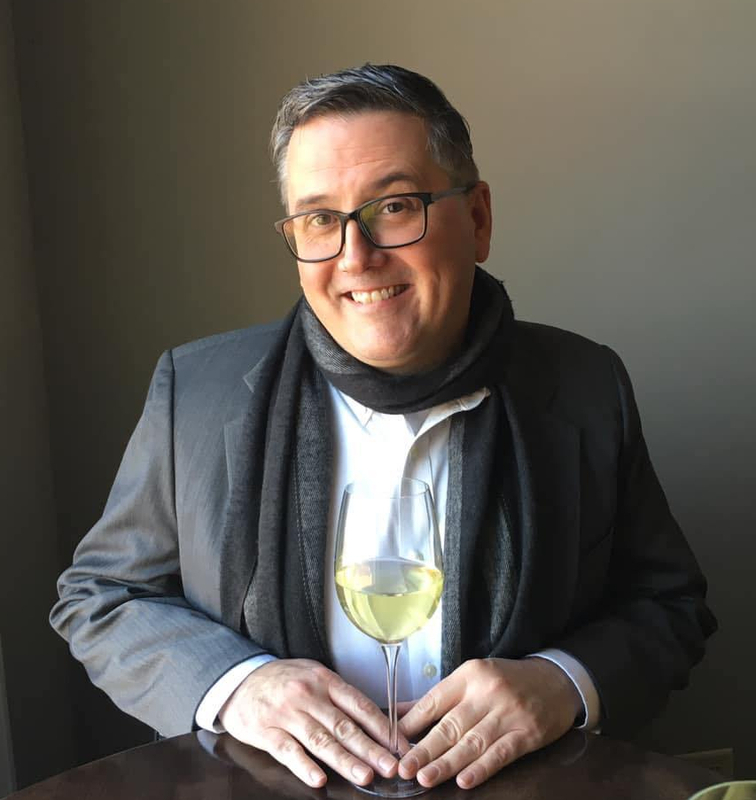 Kirk Venge winemaker. 2014 Failla Keefer Ranch Pinot Noir, Napa. $50. Yes, we’ve had this before, but so what?! It’s delicious. Ehren Jordan winemaker. 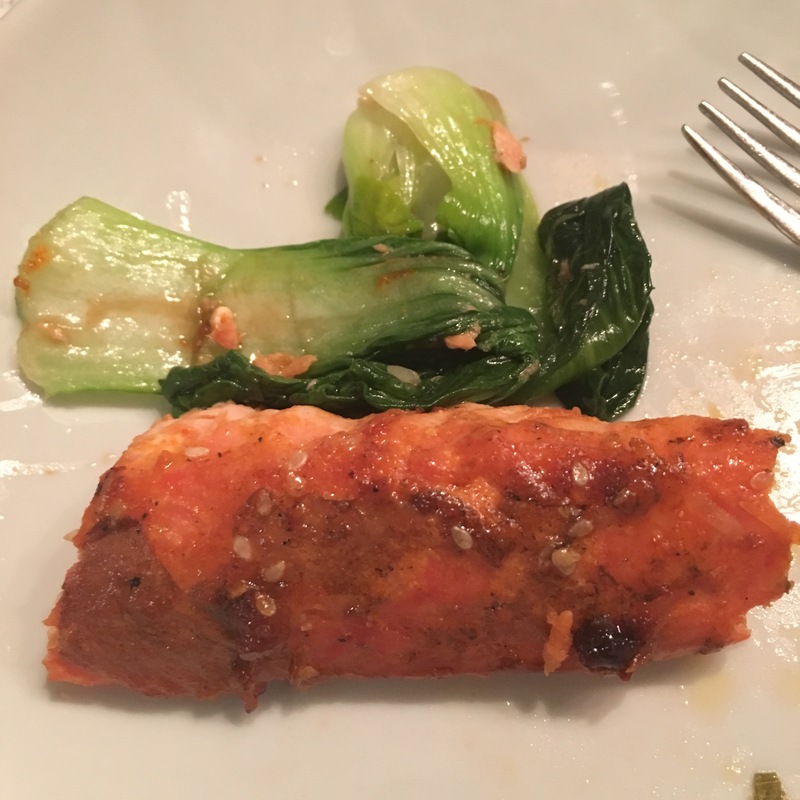 Nora prepared a punchy grilled salmon seasoned with sesame oil and other Asian spices to serve with the above wines. 2013 Blackbird Vineyards Contrarian, Napa. $135 Blend in equal parts of Cabernet Sauvignon, Cabernet Franc, and Merlot. Black fruit, smooth tannins, Aaron Potts winemaker. 2011 Lamborn Cab sav, Napa. $100. Howell Mountain. This is Heidi Barrett, winemaker, and a great one. Black fruit, anise, tannins with duration, Likely a bargain at $100/bottle. 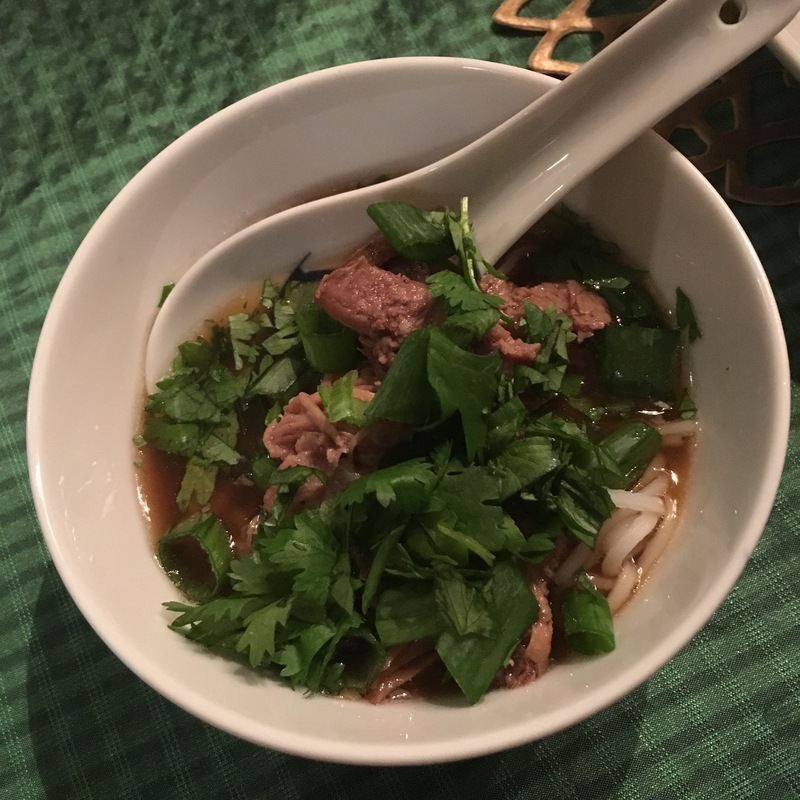 For the above two wines, Will served a Pork Noodle Soup with Cinnamon and Anise. 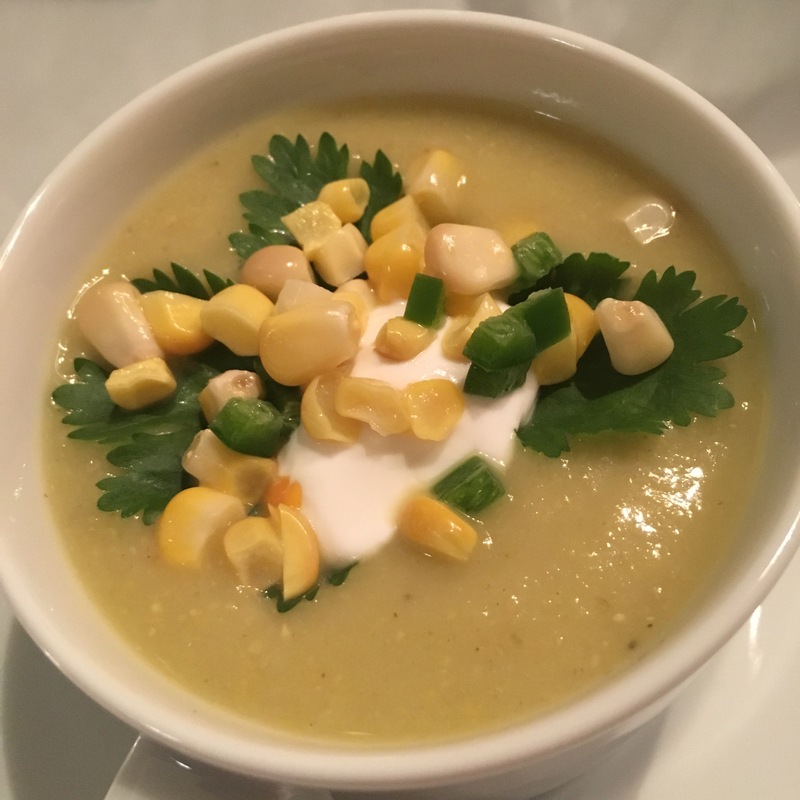 Flavorful, comforting and fragrant with scallion and cilantro. 2010 Fisher Wedding Vineyard, Cabernet Sauvignon, Sonoma. $150 Spring Mountain, all the things you like about mountain grape. Big fruit and perfect tannins. A little more age than the others. Winemaker is Whitney Fisher. 2008 Staglin Family Vineyard Cabernet Sauvignon, Napa. $125. A great wine from a tough year in the valley. More gorgeousness from Fredrick Johanssen. 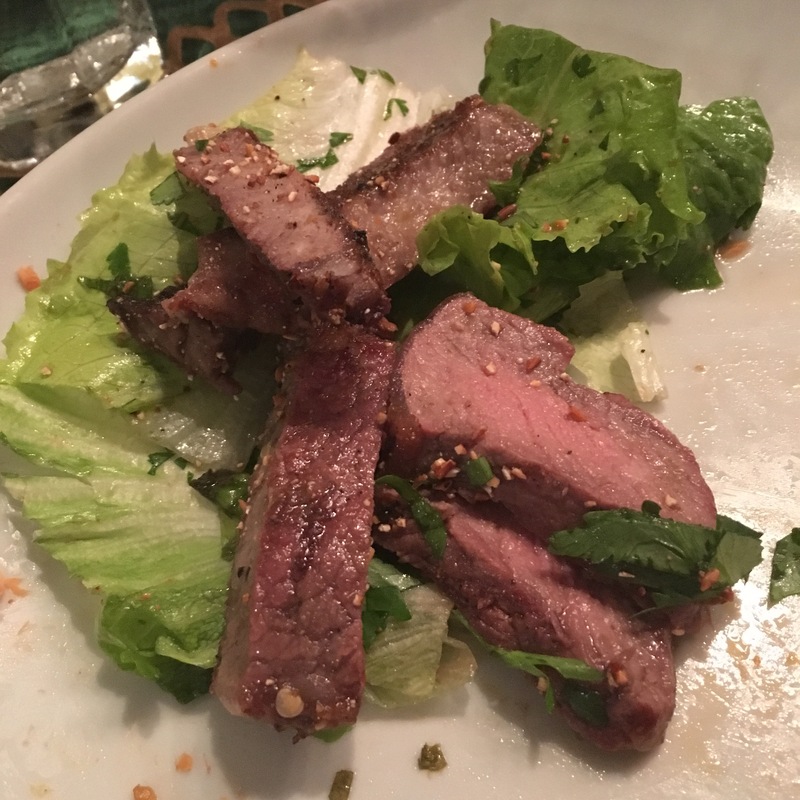 Nora and Steve served a a spicy Thai Steak Salad with above Cab Savs. 2009 Alpha Omega Petit Verdot, Napa. $100. This is the best Petit Verdot I have tasted, any vintage. Big fruit and tannins. Winemaker Jean Hoefliger. This wine was yuuuuuuge with overwhelming tannins. 2013 Alpha Omega Single vineyard Cabernet Sauvignon, Beckstoffer Dr. Crane, St. Helena. $175. Wow! Winemaker Jean Hoefliger. 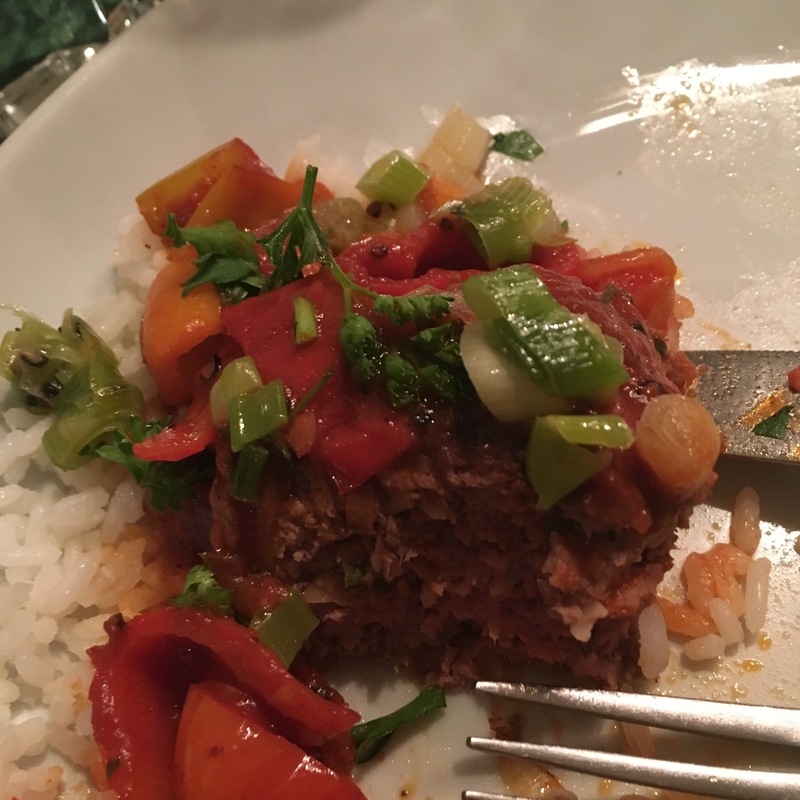 For the last two wines, Rich and Susan prepared Lamb & Beef Piperade with vibrant sweet peppers and garlic rice. 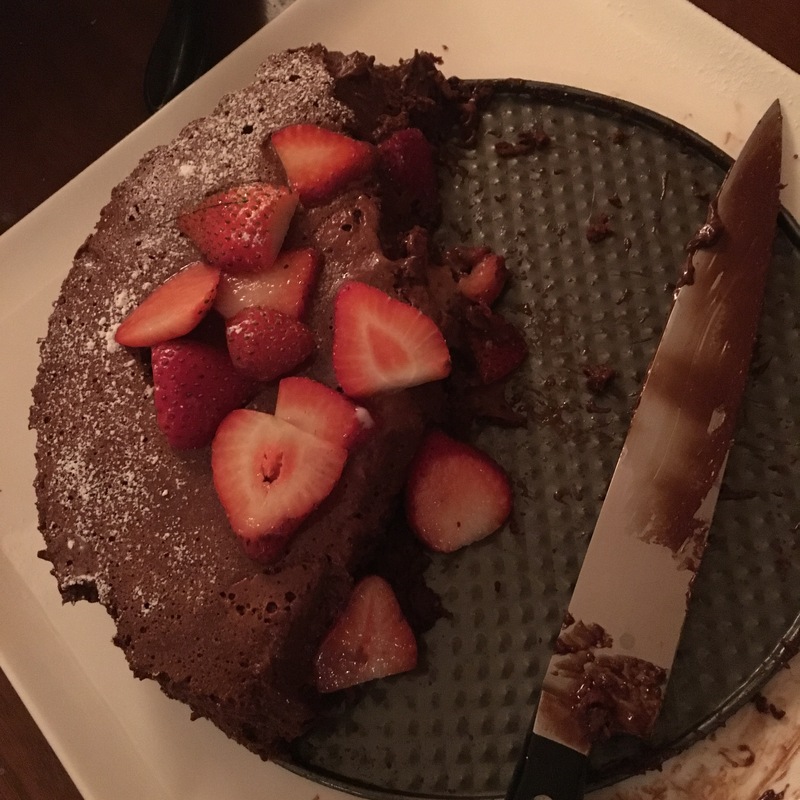 Nora also served us a rich chocolate cake topped with strawberries. Big Cabs and chocolate for the win! I raise a glass to Rich and Susan Helms, Will Batts and Curtis Petty, Debra Barteli and John Kaltner, Nora Boone and Steven Douglas, my husband Paul Linxwiler and absent members Christy Tweddle and Christy Cain. Here’s to the next 50 tastings! Wow, what a power tasting. We live in Napa and I couldn’t have put together a more impressive list of some of our best wines. Great stuff, thanks for sharing. You might enjoy our wine country blog: http://www.topochinesvino.com. Follow us if you like what you see. We have some Napa fanatics in our group. They keep us in good wines each time we get together.